In Norse mythology, the Valkyries are female warrior deities who serve Odin (the chief god in Norse pantheon). According to the Prose Edda, “Odin sends [the Valkyries] to every battle. They allot death to men and govern victory.” The primary purpose of the Valkyrie was to select the most heroic of the warriors who had died in battle and to carry them off to Valhalla (Odin's "Hall of the slain"), where they became the deathless einherjar ("lone fighters") who were to fight at Odin's side during the eschaton (Ragnarök). The Valkyries are esteemed as glorified warrior-maidens, which is a somewhat atypical depiction for women. Nevertheless, their respected military role is paralleled in other religious traditions that place an emphasis on strong female fighting figures: compare, for example, the Prophetess Deborah (in Judaism) and the Goddess Kali (in Hinduism). The word "Valkyrie" comes from the Old Norse valkyrja (plural "valkyrur"), which consists of the words val ("to choose") and kyrja ("slaughter"). Thus, the term literally means choosers of the slain. It is cognate to the Old English wælcyrige. 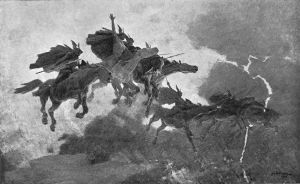 The modern German Walküre, which was coined by Richard Wagner, was derived from the Old Norse. As Norse deities, the Valkyries belonged to a complex religious, mythological and cosmological belief system shared by the Scandinavian and Germanic peoples. This mythological tradition, of which the Scandinavian (and particularly Icelandic) sub-groups are best preserved, developed in the period from the first manifestations of religious and material culture in approximately 1000 B.C.E. until the Christianization of the area, a process that occurred primarily from 900-1200 C.E. The tales recorded within this mythological corpus tend to exemplify a unified cultural focus on physical prowess and military might. Within this framework, Norse cosmology postulates three separate "clans" of deities: the Aesir, the Vanir, and the Jotun. The distinction between Aesir and Vanir is relative, for the two are said to have made peace, exchanged hostages, intermarried and reigned together after a prolonged war. In fact, the most significant divergence between the two groups is in their respective areas of influence, with the Aesir representing war and conquest, and the Vanir representing exploration, fertility and wealth. The Jotun, on the other hand, are seen as a generally malefic (though wise) race of giants who represented the primary adversaries of the Aesir and Vanir. The primary role of the Valkyries was to swell the ranks of Odin's deathless army by spiriting the "best of the slain" from the battlefield, away to Valhalla. However, it appears that there was no clear distinction between the Valkyries and the Norns because Skuld, for instance, was both a valkyrie and a norn. 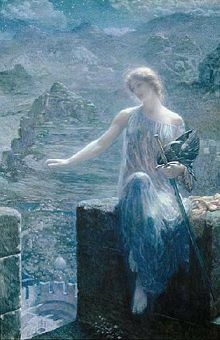 The Valkyrie's Vigil, by the Pre-Raphaelite painter Edward Robert Hughes. Hughes downplays the warrior aspect of the Valkyrie, depicting instead a beautiful young woman in an ethereal dress. Her armor and weapons are present, but set aside and unused. The conception of the supernatural warrior-maiden was presumably brought to Scandinavia in very early times from the South-Germanic races, and later it was interwoven with the likewise South-Germanic tradition of the swan-maiden ... [A] complication developed when the originally quite human women of the hero-legends were endowed with the qualities of both Valkyries and swan-maidens. In the mythological poems of the Poetic Edda, the Valkyries are supernatural deities of unknown parentage; they are described as battle-maidens who ride in the ranks of the gods or serve the drinks in Valhalla; they are invariably given unworldly names like Skogul ("Shaker"), Hlok ("Noise," "Battle") and Gol ("Tumult"). Various individual Valkyries are mentioned throughout Nordic and Germanic literature. 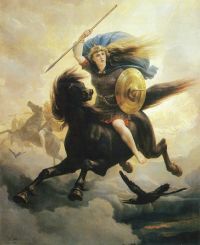 Several Valkyries appear as major characters in extant myths. As mentioned above, they are often depicted as the daughters of human kings who, for whatever reason, were given the task of leading the legion of Valkyries. Brynhildr appears in Völsunga saga. Her name means "bright battle." Hildr appears in the legend of Hedin and Högni, in Ragnarsdrápa and in the Edda. Her name means "battle." Sigrdrífa appears in Sigrdrífumál. Her name means "victory-urger." Sigrún appears in Helgakviða Hundingsbana II. Her name means "victory rune." Sváva appears in Helgakviða Hjörvarðssonar. Her name means "sleep maker." Apart from the well-known Valkyries listed above, the extant mythic corpus also contains numerous lists of additional Valkyries. However, in virtually all of these cases, nothing is known of the figures enumerated therein. Beer to the warriors bring. Guth, Hild, Gondul, | and Geirskogul. Valkyries ready | to ride o'er the earth. As can be seen from the above, several of the names exist in different versions. Many of them have a readily apparent warlike meaning - Hjörþrimul, for example, means "battle of swords" while Geirahöð means "battle of spears." However, to what an extent this multitude of names ever represented individual mythological beings with separate characteristics is debatable. It is likely that many of them were never more than names, a contention that is compatible with the fact that only a few occur in extant myths. ↑ Snorri Sturluson, Gylfaginning XXXVI, Brodeur 48. ↑ "Valkyrie". Online Etymology Dictionary. Retrieved July 10, 2007. See also: Orchard, 376. ↑ While the Prose and Poetic Eddas do discuss their roles and functions, neither groups of texts explore ontological natures or mythological origins of these beings. This analysis was performed using the online versions of the two texts (the Poetic Edda and the Prose Edda), as the ability to search them electronically greatly reduced the time-intensiveness of such a process. ↑ A fact that is attested to in many of the heroic lays of the Poetic Edda (discussed below). ↑ As Odin was described as the originator of the Nordic system of sacrifice and worship (see Lindow, 158). ↑ This process of historical development, from priestess to minor deity, is discussed in Davidson (1964). ↑ Footnote to "Voluspa," in the Poetic Edda, accessed online at sacred-texts.com. pp. 14-31. Retrieved July 10, 2007. ↑ See Orchard's "Appendix D: Names of Troll-wives, Giantesses, and Valkyries" (421-423). For accounts of the valkyries in the Poetic Edda, see Voluspa or Grimnismol, both accessible online, retrieved July 10, 2007. ↑ These heroic lays are all found in the second half of the Poetic Edda, accessible online at sacred-texts.com. Retrieved July 10, 2007. ↑ See Orchard's "Appendix D: Names of Troll-wives, Giantesses, and Valkyries" (421-423). ↑ "Grimnismol" (36), Poetic Edda, accessed online at sacred-texts.com. p. 99. Retrieved July 10, 2007. ↑ "Voluspa" (31), Poetic Edda, accessed online at sacred-texts.com. p. 14. Retrieved July 10, 2007. The Poetic Edda. Translated and with notes by Henry Adams Bellows. Princeton: Princeton University Press, 1936. 151-173. Accessed online at sacred-texts.com. Retrieved July 10, 2007. This page was last modified on 14 January 2016, at 21:57.